I am using your workbook (Adobe Captivate 2017: The Essentials) and I'm in Module 11: Working with PowerPoint. I have a PowerPoint (presentation) I created with voice recording. The PowerPoint imports just like the books says and the hyperlinks work. However, the audio is not coming working. When I spoke with Adobe support regarding the issue, I was informed that the recording file in Microsoft PowerPoint uses the m4a file format. Captivate only uses the wav and mp3 file format. 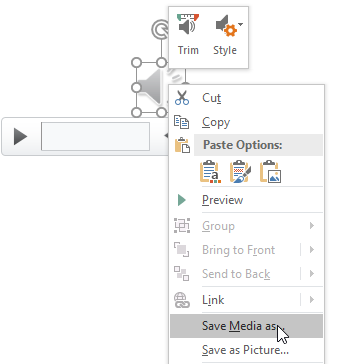 How do I get the audio in PowerPoint to work in Captivate? In truth, I never add the audio to PowerPoint slides while in PowerPoint. Instead, I always import the audio directly onto the slides after the PowerPoint-to-Captivate import process is complete. I wanted to see if the audio worked for myself so as a test, I imported mp3 audio onto a PowerPoint slide and then took the slide into Captivate. The audio worked fine. Next I recorded audio directly onto a PowerPoint slide and then took that slide into Captivate. Sure enough, the pesky PowerPoint m4a file didn’t play nice with Captivate. As a workaround, I right-clicked the audio in PowerPoint and selected Save Media as. I saved the m4a file to my computer (m4a is the only export option in the Save as type drop-down menu). Then I used Adobe Media Encoder (it’s a program that is probably on your computer already) and converted the m4a file into a mid-quality mp3. That process took a few seconds. To begin, drag the m4a file into Media Encoder. From the right side of Media Encoder, expand Audio Only. Drag one of the MP3 options over to the m4a file you added to Media Endcoder. Then click the green arrow to convert the m4a to an mp3. Once I had the mp3 file, I imported it onto a Captivate PowerPoint slide and all was right with the world. Perhaps one day Microsoft will use mp3 files for recorded audio, or Adobe will one day allow for m4a imports directly into Captivate. Until either of those events occur however, at least there’s a workaround that will not require you to re-record your audio. If you're looking to learn Adobe Captivate, check out these awesome online classes.